Tyndall Air Force Base is bordered by eighteen miles of pristine and undisturbed Gulf of Mexico beaches and these beaches serve as nesting habitat for protected sea turtles and many other coastal species. Four of the six species of sea turtles found in U.S. waters have been documented nesting on the beaches of Tyndall AFB and all of them are federally listed as a threatened or endangered species. 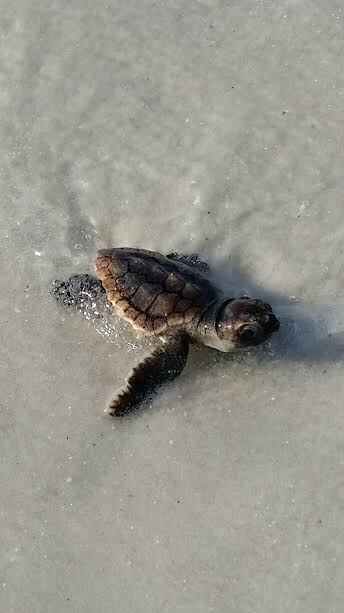 Loggerhead sea turtles are the predominant species to nest in Northwest Florida, but occasionally greens, leatherbacks, and the critically endangered Kemp’s ridley will also nest in the area. They make use of the beach and lower dunes at night to deposit on average 100+ eggs in the sand, and then return to the ocean to nest again at a later date. Under the protection of nightfall thousands of hatchlings will emerge from these beaches each summer. Hatchlings start to emerge after the nest has incubated about 60-70 days. 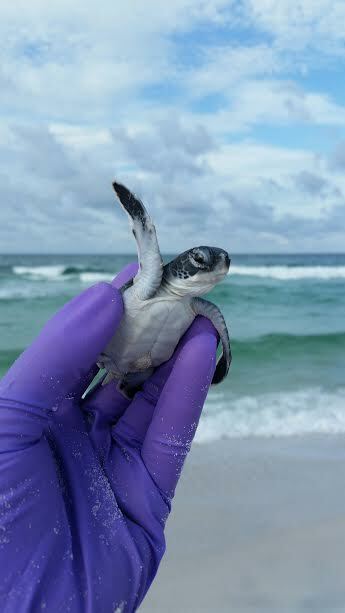 Sea turtle nesting surveys are conducted from the beginning of May through August by Tyndall Natural Resources, U.S. Fish & Wildlife Service staff, and local community volunteers. The volunteer program equips and trains interested and committed individuals to be placed on our Florida Fish and Wildlife Conservation Commission permit and survey designated beaches during weekends through the summer months. These morning surveys begin at 5:30 A.M. every Saturday and Sunday from May 1st through August 31st. State and local trainings are required in March to be placed on the permit. Anyone who is interested please email to have your name added to a volunteer list. * Volunteer applications can be sent to email address above. 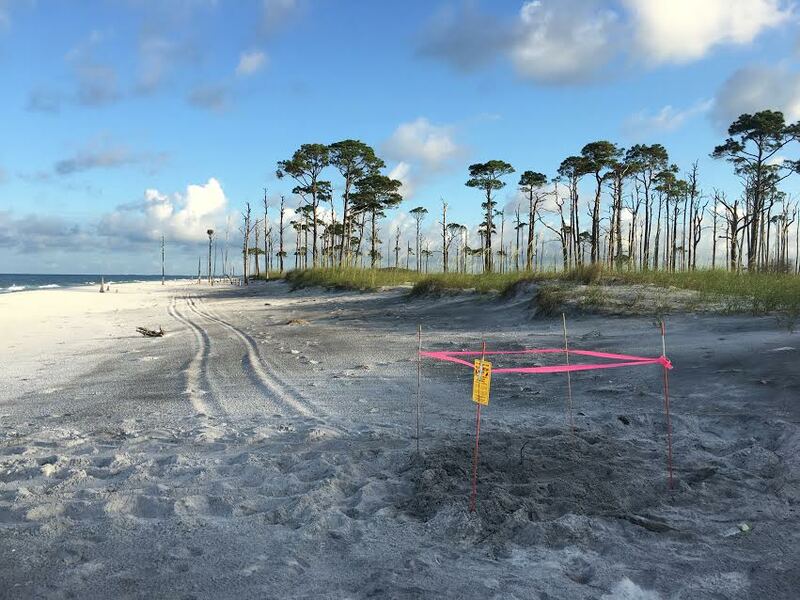 Tyndall Natural Resources maintains appropriate permits to monitor sea turtle nesting and hatching from Florida Fish and Wildlife Conservation Commission. The objective of the sea turtle monitoring program is to provide nest location information for military mission avoidance purposes and collect annual data to determine the distribution, abundance, and success of sea turtle nesting activity along 18 miles of Tyndall's beaches. This data is then reported to help provide Statewide nesting productivity assessments. Nesting surveys are conducted at sunrise daily through the nesting season and are designed to locate the crawls of nesting female turtles, determine false crawl or nest status, identify species by crawl, and protect nests from potential loss from predators. The nests are fitted with a self releasing wire screen secured by fiberglass stakes and marked with an ID tag and sign. All nests are excavated 72 hours after hatchling emergence or after an 80 day incubation period with no sign of emergence activity to determine the nest success. Tyndall Turtle Trackers consists of Natural Resources staff, U.S.. Fish and Wildlife Service staff, active duty military, military retiree's, military dependents, and local community volunteers who commit their time to help ensure the conservation and protection of sea turtles and their nests. Volunteers have the opportunity to assist in the efforts of locating, marking, and protecting nests deposited on Tyndall beaches every weekend through the nesting season. We operate under State permit # 052 which allows us to have up to 25 committed volunteers. Volunteers are required to attend various training events and help conduct surveys during early morning hours. Occasionally some lucky volunteers may have the rare privilege of encountering a nesting sea turtle on surveys or watching hatchlings emerge from nests and make their way into the Gulf of Mexico waters.